Cyprus has long been an established holiday destination, favoured especially by sun-worshippers thanks to its superb climate. Cyprus is rated 4.5 out of 5 based on 2 verified reviews from YGT customers. They played and stayed (we even checked they signed their scorecards). The average temperature for the year in Cyprus is around 24º Celsius, and it has some terrific beaches. However, with the landmark creation of the all-encompassing 5* Aphrodite Hills resort, Cyprus has been put on the European golfing map, particularly around the coastal town of Paphos in the west. 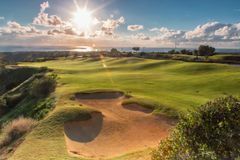 A great blend of history and hospitality is at the heart of the island's charm, and with its emerging golf options, Cyprus has become a great destination for a golf holiday in the sun. Cyprus has a subtropical Mediterranean climate that sees mild winters and hot, dry and sunny summers. The surrounding seas ensure that significant fluctuations in temperature are rare, while moderating the humidity. Polo Shirt, Tailored Shorts - No Waterproofs Required! A fairly comprehensive coverage of UK routes from a range of carriers makes Paphos ideal for a sunny escape from September right through to early summer. And what’s more, the climate is more than golf-friendly, apart from the fiery months of July and August. Situated near Paphos, the fascinating layout at Elea Golf Club was designed by Sir Nick Faldo, who believes it has the potential to put Cyprus firmly on the golfing map. That’s a good enough endorsement for us! The course is just a stone’s throw from the Athena Beach Hotel. A range of sport and leisure activities, coupled with the hotel’s coastal location make this is a terrific base for travelling groups. Minthis Hills is another great option for golfers, with an undulating 6,373 yard course that is as challenging as it is beautiful. The scenery at the the prestigious Secret Valley Golf Club is equally stunning, plus its convenient positioning from Paphos makes it an easy inclusion in your itinerary. Upon inspecting its unique seafront location, range of accommodation and dining options, and outdoor leisure facilities, it isn’t hard to work out why the Alexander The Great Beach Hotel has built a reputation as one of the most alluring hotels in Cyprus. The hotel even has an “adults only” section, perfect for couples seeking privacy and peace while enjoying a full sea view, private garden and private infinity pool. The Korineum Golf Resort is situated on the north (Turkish) side of the island, close to the historic town of Kyrenia and the shores of the gorgeous Turtle Beach. Couples will love the on-site dining options, with good food complimented by amazing views over the resort, plus the relaxation on offer at the Korineum Spa. For unrivalled convenience, the Capital Coast Resort is hard to beat. The stylish beach hotel is positioned on Paphos’ western seafront, surrounded by endless restaurants, bars and shopping opportunities, while the Minthis Hills and Secret Valley golf courses are just a short drive away. The nightlife in Paphos is equal to that of many larger European cities, with a selection of fantastic restaurants and bars scattered around the harbour area. There is an entire street dedicated to evening entertainment, known simply as “Bar Street”, which attracts big crowds of partygoers once the sun goes down. This concentrated area of venues includes favourites like Woodyz Music Bar and Rainbow, which are part of the total Paphos experience. Overlooking the Petra tou Romiou (Aphrodite's Rock), Aphrodite Hills is a deluxe 5* resort which has quickly emerged as a premier luxury golf holiday destination. The hotel boasts 290 luxurious guest rooms and suites, all perfectly situated to enjoy the myriad of golf, leisure, spa and wellness activities on site. The quality of the hotel and facilities is complemented by Cabell B Robinson’s outstanding championship golf course.